Tópico em 'Biosfera e Atmosfera' iniciado por Vince 10 Nov 2008 às 10:50. Quase 96 por cento da água potável a nível mundial encontra-se em aquíferos subterrâneos, que pela primeira vez foram avaliados e cartografados num mapa divulgado esta semana pela Organização das Nações Unidas para a Educação, Ciência e Cultura (Unesco). O volume de água destes aquíferos, que atravessam o subsolo de vários países, nos cinco continentes, é cerca de cem vezes superior ao existente na superfície da Terra, fornecendo, por exemplo, mais de 70 por cento de toda a água consumida na União Europeia. No entanto, apesar da sua importância estratégica, nunca tinha sido elaborado, até agora, um levantamento global destes cursos de água transfronteiriços. Alem de identificar no mapa a sua localização e percurso, o estudo agora divulgado pela Unesco avalia ainda a qualidade da água subterrânea para o consumo humano e o seu nível de renovação. No total, este levantamento abrange 273 aquíferos subterrâneos partilhados por, pelo menos, dois países, dos quais 90 só na Europa Ocidental. De acordo com o Programa Hidrológico Internacional da Unesco, nem todos os aquíferos identificados são renováveis e muitos estão ameaçados pela sobre-exploração e por altos níveis de poluição. Para evitar que o mesmo aconteça com outros cursos de água, é necessário criar mecanismos internacionais para a gestão destes recursos. Por isso, a Assembleia-Geral das Nações Unidas vai elaborar, já na próxima segunda-feira, um documento que servirá de base a uma futura Convenção sobre Aquíferos Transfronteiriços, um diploma que vai obrigar os estados a preservar estes recursos e a cooperar para controlar a poluição. Lançado em 1999, o Programa Mundial para a Cartografia e Avaliação Hidrológica, que elaborou o mapa agora divulgado, visa melhorar o conhecimento e gestão dos recursos aquáticos naturais. They are one of the world's greatest and most precious natural resources, yet are entirely hidden. Now, for the first time, a high-resolution map shows where underground aquifers store vast amounts of water. The map of "blue gold" (pdf format, 4 MB) is the result of nearly a decade of sometimes difficult talks between neighbouring governments, mediated by UNESCO. The hope is that it will help pave the way to an international law to govern how water is shared around the world. Aquifers are underground layers of rocks or sediments from which water can be extracted – normally by drilling boreholes or digging wells. They hold 100 times the volume of freshwater that flows down rivers and streams around the world at any time. 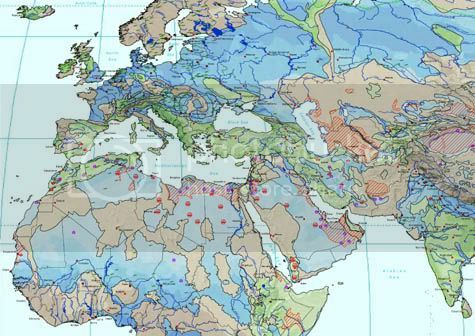 What the UNESCO map reveals is just how many aquifers cross international borders. So far, the organisation has identified 273 trans-boundary aquifers: 68 in the Americas, 38 in Africa, 155 in Eastern and Western Europe and 12 in Asia. Each trans-boundary aquifer holds the potential for international conflict – if two countries share an aquifer, pumping in one country will affect its neighbour's water supply. "This [map] is a fantastic resource which a lot of us have been waiting for it for," says Mark Zeitoun, a water policy expert at the London School of Economics. "It highlights the importance of groundwater resources, which is generally misunderstood or ignored completely compared to surface water." The increasing reliance on aquifer groundwater – because there is more of it and it tends to be less contaminated by industrial run-off – has been called the "groundwater revolution". But it is a revolution with worrying environmental consequences. In many parts of the world, around the Mediterranean for example, but also in the US and the Middle East, water tables are falling and aquifers are being infiltrated by seawater as agricultural practices pump water out faster than it can be replenished by rain. When aquifers fall between countries, sustainable management requires international agreement. Yet, historically, many agreements have been weighted towards the richest or more powerful country. The most well-known example of this is the 1995 agreement between the Israeli and Palestinian authorities. This granted Israel rights to 90% of the water contained in four aquifers (and the Jordan river) which span both territories. "I do not think that [by pinpointing where aquifers lie] the map in itself has the potential to provoke water conflicts," says Richard Taylor, a hydrogeologist at the University College of London in the UK. "It would be very difficult for even a very skilled person to say from this map that 40% of a particular aquifer 'belongs' to one country and 60% to its neighbour," he says. This is because there are a number of variable that could define a nation's "right" to groundwater. 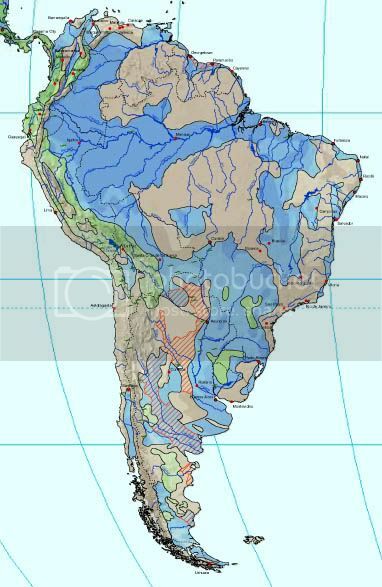 Where an aquifer lies relative to an international border is one variable, but others that could be considered include: which nation's geography contributes most to the aquifer's recharge, the size of the respective populations, and the amount of water removed to irrigate crops. The UNESCO map merely helps define the geographical extent of an aquifer, which could be useful in defining international agreements. The map could also help countries better manage their water. Taylor points out that neighbouring governments will be able to share technologies and strategies for exploiting a shared water resource without sucking it dry. Zeitoun, who advises Palestine in its water-sharing negotiations with Israel, is one of many would like to see these variables formalised in an international legal framework for water management. "There is an urgent need for an international law on water sharing," he says. At the moment, the only legal framework is a 1997 agreement under the United Nations relating to "non-navigable freshwater resources". The document was initially drafted to regulate the use of surface water, and attempts are underway to extend it to underground resources as well. The political intricacies of such a legal framework are considerable. For starters, aquifers fall into two gross categories: those that are recharged by rainfall permeating from the surface and "fossil" aquifers, such as the famous Nubian sandstone aquifer beneath Egypt, Sudan, Chad and Libya. These contain water that can be tens of thousands of years old, relics of a much wetter climate. Crucially, they are not recharged by rainwater, making them finite resources. Exploiting fossil aquifers is "a race to the bottom," says Zeitoun. "Typically they are seen in much the same way as diamond mines." Nations that share a fossil aquifer must agree on how to run that race – but they don't always agree, and that can cause conflict. Rechargeable aquifers present an entirely different political – and scientific – challenge. The best use of the water from an environmental perspective is to use the water at the same rate as it is naturally recharged, or more slowly. This implies knowing how the aquifer is recharged and agreeing on the fairest way of sharing the water that can be sustainably extracted each year. "You have to really understand the water flow, so you can put sustainable limits on its exploitation," says Zeitoun. UNESCO is expected to make public a more detailed map of trans-boundary aquifers in spring of 2009.